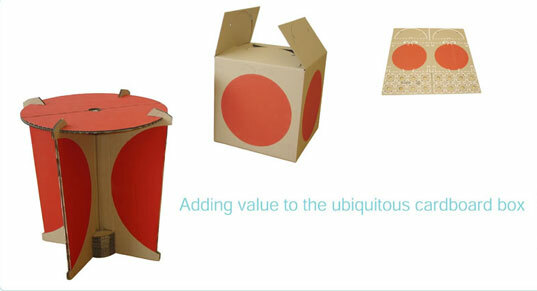 Designer Ian Gonsher, a recent graduate of the MFA program in furniture design at RISD, offers a refreshing proposal for repurposing cardboard packaging with his origami-like Box Table. It’s like the grown up’s version of the forts my brother and I would build out of a cast-off appliance boxes when we were kids. It should be noted that Ian Gonsher was previously recognized by ID Magazine’s Student Design Review for his clever collapsible fruit bowl made from a single piece of laser-cut wood. Interesting idea, but the guy obviously never packaged or received a box that had to go through a shipping carrier. There's so much tape, label and pouches on the box on arrival that it would be nearly impossible to build the table. So, 10 points for the idea, but minus several millions for the real-life testing. um, well, its cool that you add links about the artist/designer adn his school but what about the most important link? where can we get one? It's so cool!!! Do you have any more?? This is really great. Anytime packaging is designed for re-use I am happy and really congratulate your efforts.